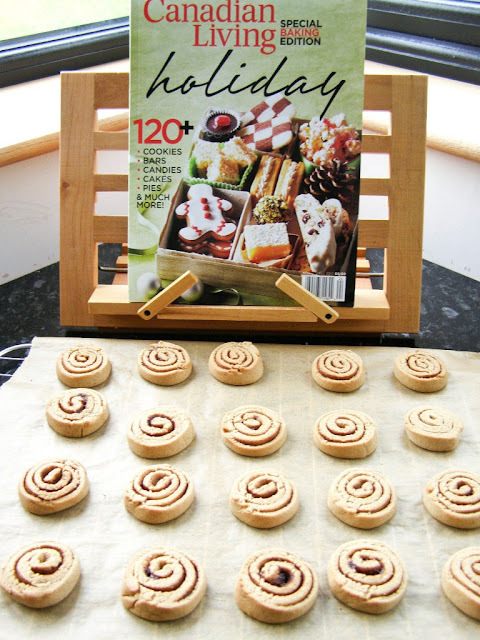 Well, it's that time of year again when my mom sends me the latest Canadian Living Holiday Baking magazine special! I love these, as I'm sure you'll know by now if you've read this blog for any length of time as they always have great ideas. 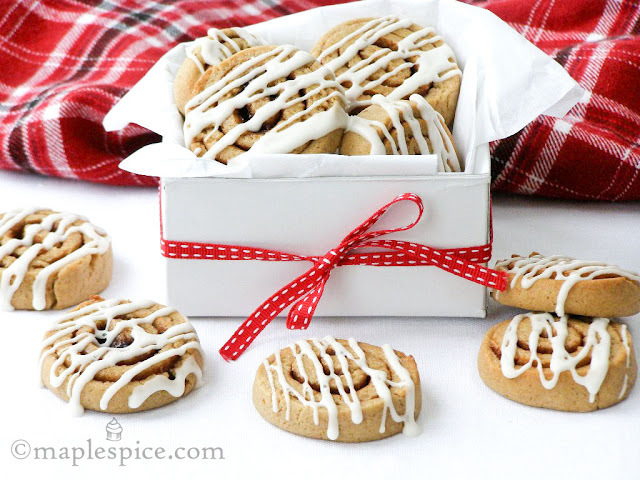 I immediately started jotting down recipes I wanted to veganize and these Cinnamon Roll Cookies were first on my list. I've simply replaced the egg with a little plain soy yogurt and of course the butter with vegan butter but mostly made some changes in the method. Namely I've found that giving the dough a little knead after the first chill helps develop the gluten a bit which in turn helps the dough bind together better without the egg. 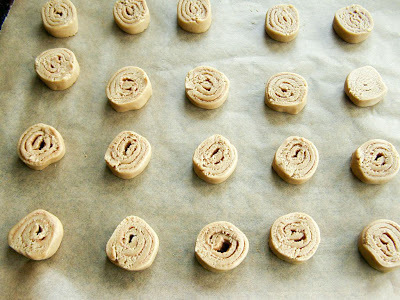 In the end these cookies are delicious and as you can see, beyond cute! They are small, which may not come across in the pictures here, only about an inch and a half wide, taste almost just like cinnamon rolls and would make great gifts this holiday season as they hold together and pack really well. The texture is lovely, slightly crisp on the outside but soft inside and you can eat these just like a cinnamon roll - by peeling off the layers until you get to the solid middle full of buttery, cinnamony loveliness! 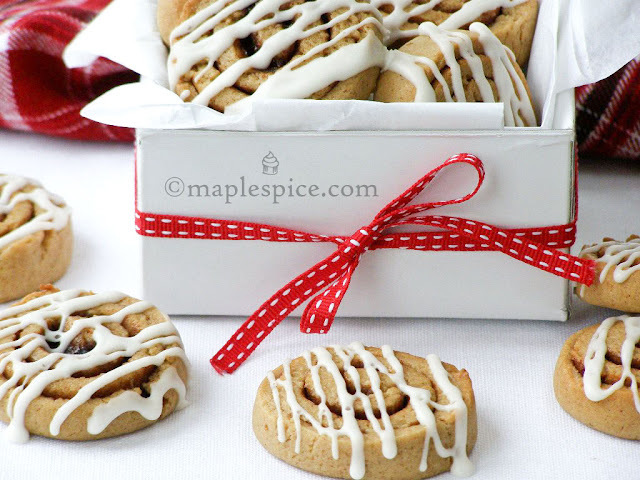 As for the glaze, the recipe called for a cream cheese glaze, which of course would go perfectly with a cinnamon roll cookie. I didn't have any cream cheese when I first made these so just made a basic vanilla glaze, as you see in these pictures, which was perfect. The next time I made these I did make up a cream cheese glaze which was delicious BUT it wouldn't really drizzle easily like the first glaze, the cream cheese made it rather gloopy so it was easier to just spread all over the top. Tasted good but then you lose the look of the cinnamon roll, it just looked like a glazed round cookie. You could pipe it on but furthermore, the cream cheese glaze never set, and that set, slightly crisp drizzle glaze is essential (I think). 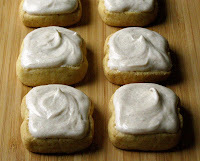 So, in the end the cream cheese glaze was a fail so I'm sticking with the regular vanilla glaze for these. In a large bowl add the vegan butter, brown sugar, soy yogurt and vanilla and beat well until lighter in colour and somewhat fluffy. 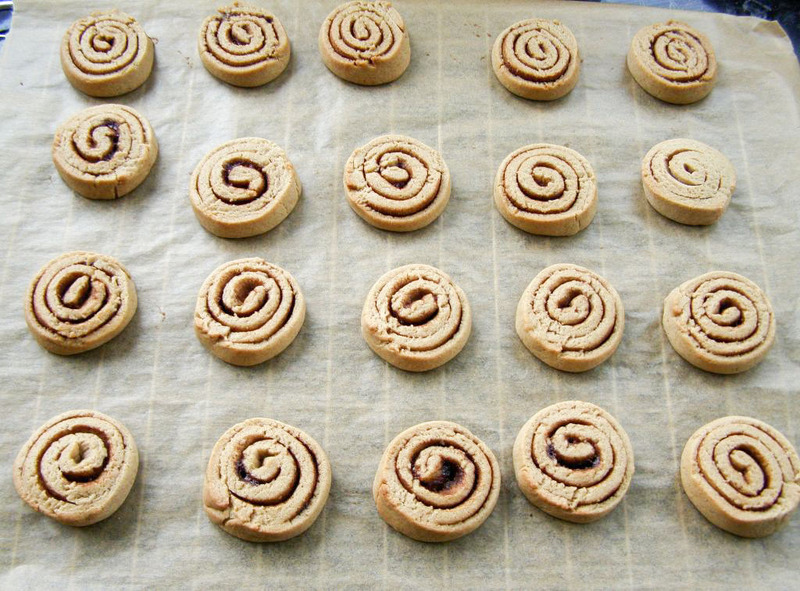 In a seperate bowl mix together the flour, cinnamon, baking powder and salt. Add half of this to the butter mixture and beat well until all incorporated then add the rest of the flour to the mixture and beat well. 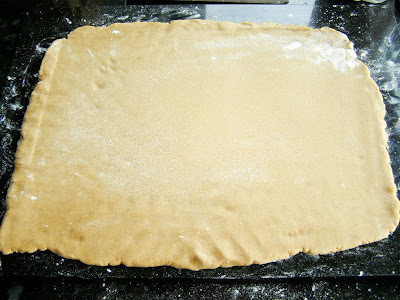 You should have a dough that is slightly crumbly but will squish together. Pull it all together with your hands and shape into a ball and wrap in cling film. Chill in the fridge for at least 1 hour. 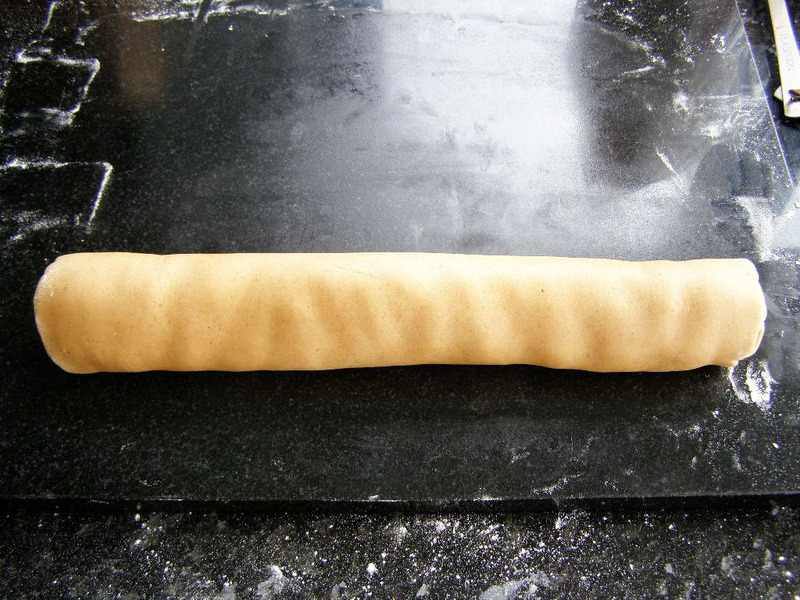 After chilling, if you try and roll the dough out now it will crack and split and you'll be cursing my name to high heaven! Flour your work surface and knead it. You must knead it here, not hard like you are making bread, just a gentle knead for about 2 - 3 minutes. You will notice the dough change from rather firm and crackly to a smooth ball. Add more flour as need be to stop it from sticking but don't go overboard, I probably added no more than 1 tablespoon here. Keep the surface dusted with flour and roll the dough out to a 30 x 25 cm rectangle. Approximate, you don't have to be overly exact here! Note: the spread will be thin! From the long side, carefully roll it up, pinching the long end to seal, roll it a little bit to keep it round and you'll find it has stretched out a bit at this point. I slightly push the ends in to get it back to around 30cm long. It will be VERY soft at this stage, and yes, now you may be cursing my name to high heaven, lol! 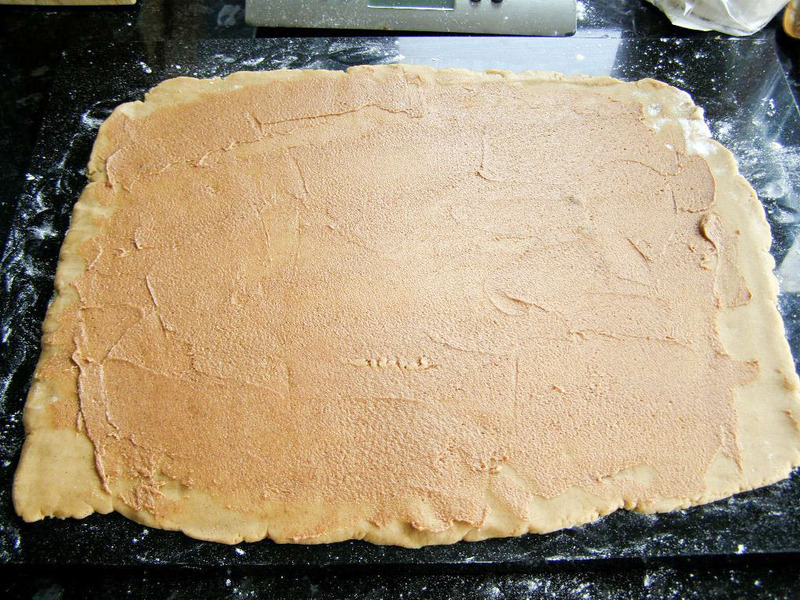 Carefully transfer it to a sheet of cling film, wrap it up, place it on a long plate or baking sheet and freeze it for 30 minutes to firm up. Now bake in the preheated oven for about 15 minutes, rotating the pan once halfway through. 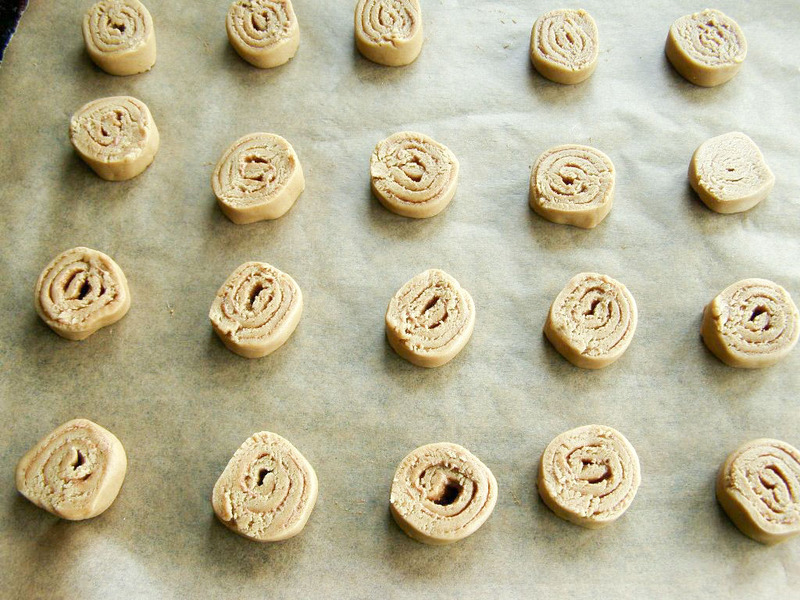 They will be lightly golden around the edges and feel fairly firm. Leave to cool on the sheet for a minute or so then transfer to a wire rack to fully cool. I just transfer the whole sheet to the wire rack so they don't get rack marks on them. Once they are fully cool make the glaze by mixing the icing sugar, soy cream or milk and vanilla together until you have a thick yet runny glaze. When you spoon it up it should fall like ribbons back into the bowl. 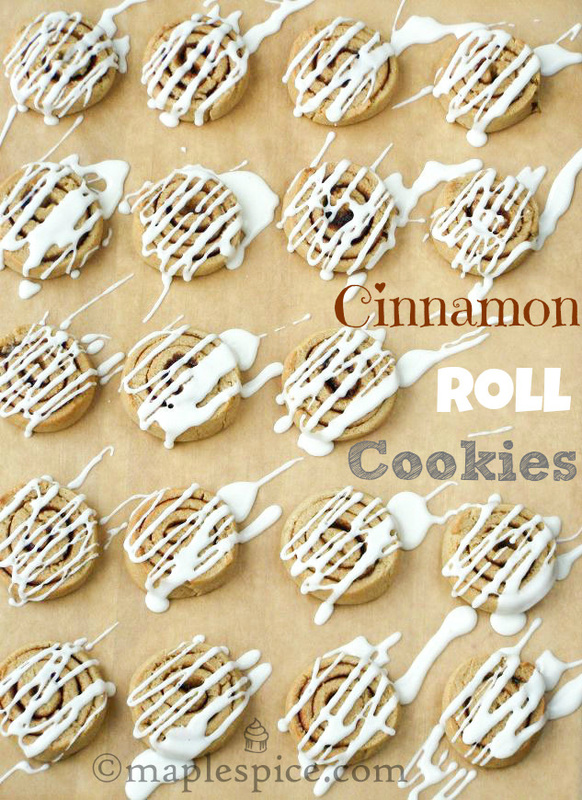 You don't want it too thin or the lines will just run into each other and you'll end up with thinly glazed cookies instead of drizzled. Add more icing sugar and or 'milk' until the consistency is right. Then simply drizzle over the cookies, whilst on the sheet to catch the drips, back and forth until done. 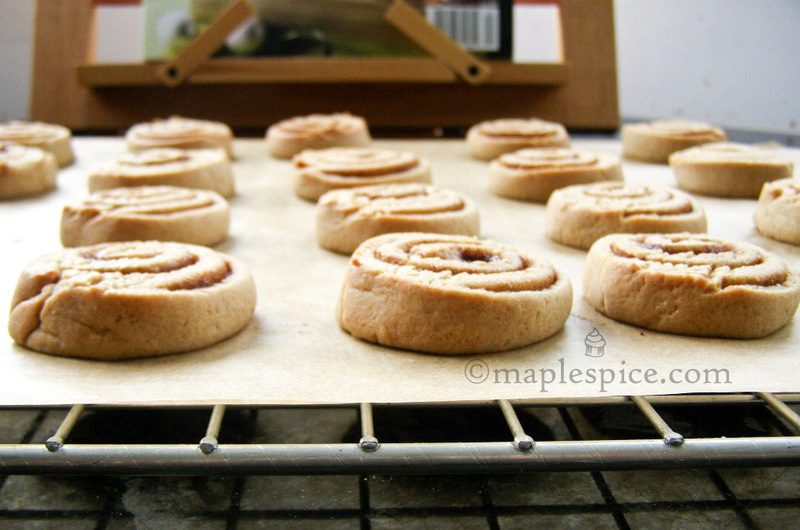 You will probably have glaze leftover but it's better to have more than not enough. Leave the glaze to set then enjoy! Those look amazing! I love them! I've made pumpkin cinnamon roll cookies before and they were fantastic. These look great and are going on the list, thanks so much! Did you ever try doing these with pumpkin? Maybe replacing the butter with it? Wow, these look absolutely amazing! I will definitely have to try your recipe...thx so much for posting! Many thanks for all the comments! Shannon and Anonymous, I had to laugh when your two comments came in one after the other! 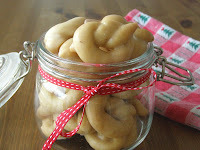 I haven't tried them with pumpkin as I find them perfect just the way they are. I know the online food world has gone pumpkin mad lately, even the NY mag writing an article titled "pumpkin is the new bacon" (which is a great read) but I'm afraid I won't be getting on this bandwagon. I mean I love pumpkin pie, but it kinda ends there for me, lol! I suppose it's because I love how pumpkin pie is this special flavour I only get twice a year, we only ever had it at Thanksgiving and Christmas and I don't want that memory to get watered down by eating a lot of similarly flavoured things. Like I wouldn't enjoy the pumpkin pie as much then....if that makes sense! They look perfect and adorable and would make the best Xmas gift!! Those are the cutest things ever! I really need to pick up a copy of that magazine, I've already started planning my Christmas baking in hopes that I'll actually get some done this year.